Connects to any Neptune 1Link or EB832! The intelligent Neptune COR-15 Return Pump is easily the smartest pump available. Directly connecting to any Neptune EnergyBar832 or 1Link module, you no longer have bulky power adapters or wall warts to power the COR pumps saving you outlet space and making cord management easier to work with. COR pumps come standard with advanced control features that can be found by using the Apex Fusion Cloud Software. Add a COR pump to your system today to see the difference. Don't have an Apex? Check out the COR-20. The COR pumps were built from the group up with control in mind. Have power over everything including the CORs output percentage, real-time operational feedback, compared feed routines, pump status can all be monitored and controlled with Apex Fusion. Once the COR pump is plugged into a 1Link port, and after a couple button presses you can set the pumps flow rate and feed mode settings. By enabling IQ-Level, you can set the min and max flow rates for your aquarium. 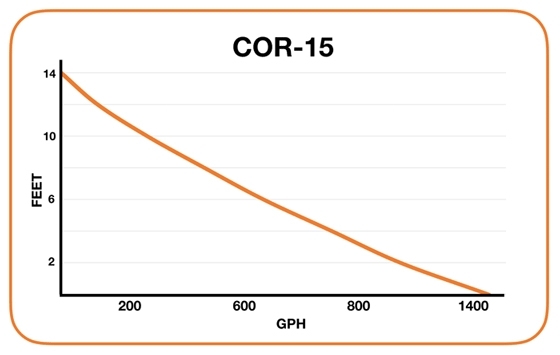 The powerful COR-15 can push up to 1500 gallons per hour with an incredibly efficient head-loss curve. Each pump comes with multiple different output fittings that let you adapt the COR pumps output to match your reef tanks current plumbing size. It is suggested to use the largest 1.25" Union that is included, but it is totally fine to use the other 0.75" or 1.0" adapters if needed. Because not all aquariums are alike, Neptune Systems included IQ-Level technology with every COR pump. Customize the minimum and maximum speed settings for your tanks plumbing to the ideal flow rate, but also the minimum flow rate for in tank flow and feed modes as well. Neptune's COR uses the latest in Vector Control, BLDC motor technology. Driving the COR pump in a way that is super energy efficient using less than 50W at full power, and staying vibration and noise free. Know what is going on with your pump at all times. COR pumps come loaded with features that let you monitor your aquariums "heart" giving you the chance to fix something before it fails. Saltwater aquariums are notorious for creating calcium and other mineral build up on pumps and there internal parts that can inhibit the flow but more importantly could cause damage to the pump. Neptune Fusion lets you monitor the pumps internal temperature along with its wattage draw and flow rate allowing you to set alarms and alerts if something goes out of their normal thresholds. If the temperature of the pump increases to unsafe levels, the COR will actually slow itself down until temperatures reach a safe level again, giving you time to react and maintain the pump. Requires 1Link Port & Apex Controller for use.